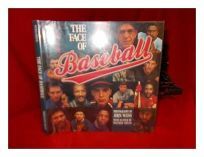 Weiss, who began stalking major-league players in 1984, here compiles a book of striking, wonderfully revealing photographs. These aren't the figures-in-action shots seen in sports magazines, but pictures of players stretching and kidding around in the dugout, of players at ease in those moments before the pressure and drama of playing the game. But the real gems are the portraits. Weiss set up a black dropcloth near the dugout and enticed the 67 players depicted here to mug and pose. The resulting color photographs are beguiling. Captured are former Yankee Willie Randolph's quiet intensity, pitcher Vida Blue's charming good humor. Former Yankee manager Lou Pinella's face is relaxed and inviting, and batting champion Tony Gwynn's is even more so. Longtime fan Sheed's essay is both a meditation on these well-known faces and on the average fan's attachment to the game. Weiss's afterword describes his working habits and relates choice anecdotes he collected along with these uncommon faces. (June).